If you're involved with Rehab or patient care then you probably know all about Invacare's HTR5500. This chair has all the positioning options at your fingertips. 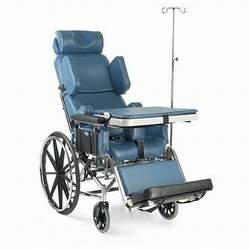 Using Tilt-in-Space in combination with it's Full Recline feature allows infinite positioning for maximum patient comfort. The HTR's seat, armrest, and elevating footrest are all adjustable as well.